Ann Sheridan came to Hollywood in 1933 as a finalist in a beauty contest, a publicity stunt for Paramount's Search for Beauty. Of the 30 contestants who appeared in the picture and the 6 finalists whom Paramount put under contract, she was the only one to achieve stardom. Her films included Angels with Dirty Faces (1938), They Drive by Night (1940), Kings Row (1942), and Come Next Spring (1956). Through the years, she appeared on stage and on many radio and television programs. As with her film career, her broadcasting work was diverse, including appearances in dramas, comedies, talk shows, variety revues, and game shows. In 1965 she joined the cast of Another World, thus becoming one of the first movie stars to appear in a soap opera. Her role led to a prime time series, the situation comedy Pistols 'n' Petticoats (1966-1967). She died during production. This reference book chronicles Ann Sheridan's fascinating life and career. The volume begins with a biography that traces her rise to stardom and her many successes in the entertainment world. A chronology then summarizes the most important events in her life. The chapters that follow provide detailed information for her work in films, radio, and television. Entries are provided for each of her performances, with each entry giving cast and credit information, a plot summary, excerpts from reviews, and critical commentary. The book also includes information about recordings of Sheridan's songs, the various awards and honors that she won, and magazine covers on which she appeared. 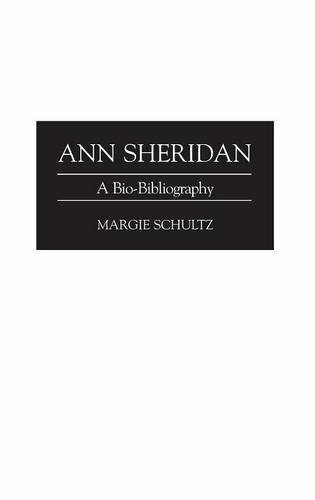 The volume also presents an extensive annotated bibliography of works about Sheridan and lists sources of archival material.